Description: Not really Lake State, but here is #381 (and #281) shortly after delivery to the D&M in 1981, taken by my Dad. Both units scrapped in November, 2011. 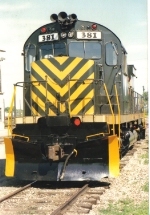 Description: A D&M Alco road unit outside the enginehouse.